Shown here is a late 18th century Chinese export porcelain design bearing resemblance to the flow blue pattern featured above. 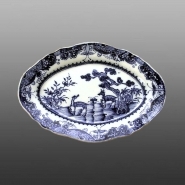 Seen here is a late 18th century painted English earthenware version of the Spotted Deer pattern on an indented oval platter. Here, the pattern is reversed from the Chinese version. A small earthenware platter printed in flow blue in the named pattern Cashmere. The pattern is reminiscent of an original Chinese export porcelain design, sometimes referred to as Spotted Deer, shown below, a design that was copied by a number of makers in the late 18th and early 19th centuries.